A delectable pink moist cake perfect for summer! Very easy to prepare as you just basically mix everything together to make the batter, pour into a baking pan and bake! You can use a traditional sheet cake pan or a 9"x13" baking pan but adjustments must be made on cooking time: around 25 minutes when using the sheet pan and around 40-45 minutes for the 9"x13" baking pan. The strawberry icing on top makes it even more scrumptious! Here is an easy dessert recipe for Strawberry Sheet Cake. Preheat oven to 350 degrees. Lightly grease sheet pan or 9"x13" baking pan using cooking spray. Combine all ingredients for the cake and mix thoroughly. Pour into prepared pan. Bake for 25 minutes (40-45 munites when using 9"x13" baking pan) or until a toothpick inserted in the center comes out clean. Take out from over and set aside to cool completely. Meanwhile, prepare the icing by mixing together all icing ingredients until smooth – may need to add more powdered sugar or strawberries for a spreading consistency. Once the cake is cool, spread the icing on top. Refrigerate for at least 2 hours before serving. 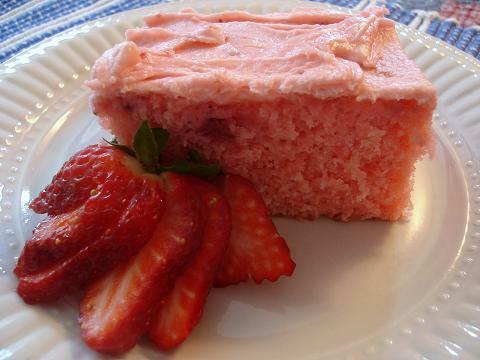 Store leftover Strawberry Sheet Cake in the refrigerator.